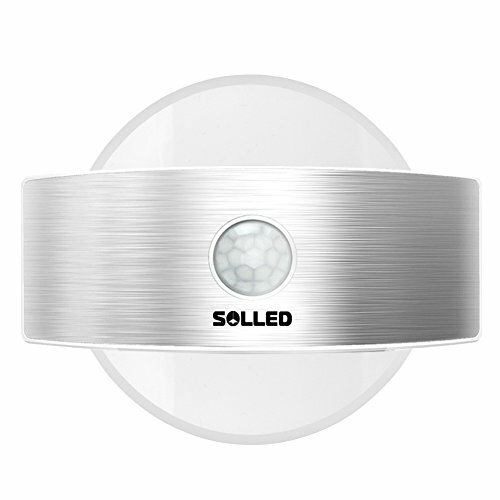 High sensitive: The motion sensor detects any movement from as far away as 10-16 feet. Sticky adhesive tape: The adhesive can stick tightly to most surface. No worries that it will drop off from the wall. Also two screws are provided for reinforcement. "No" or "Auto" function: When switch it to "on" position, the light will light up continuously. But when switch it to "Auto" position, the light only light up after detecting the human movement in the darkness. Compact body and modern design: The light looks very elegant and aesthetic. Two power ways: Charge the built-in lithium batteries for daily use. Or powered by 4 pcs AA batteries for outdoor use. Wide applications: Bedroom, hallway, washroom, balcony, corridor, stair, attic, the basement, garage, cellar, wardrobe, kitchen cupboards, bookcase, tents etc. 14 PCS SUPER BRIGHT LEDs: 14 energy-saving SMD2835 LEDs provide bright white light. MOTION SENSOR NIGHT LIGHT: Leave it on "Auto" position and it detects people's movement and shuts off about 15s thereafter. TWO POWER WAYS: Built-in 600mAh lithium battery (can be recharged by the provided Micro USB cable) or powered by 4 pcs AA batteries for emergency use (the AA batteries are not provided). ENERGY-SAVING: When on "auto" mode, it does not light up if there is already adequate light in the room even in night, which saves energy and saves the battery life. VERY EASY INSTALLTION: Mount with provided sticky adhesive tape or screws (both accessories are provided).